It’s time again for another Stamp Review Crew blog hop! 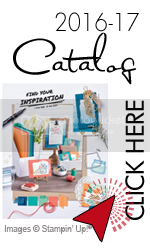 This time we are featuring the Jar of Love Stamp Set. 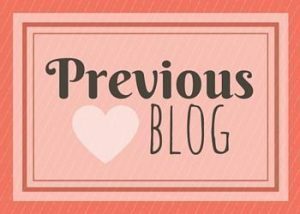 You may have just arrived from Debra Burgin’s Blog, or if you are going backwards from Tanya Boser’s Blog. No worries, even if you are starting here. All of the blogs link in a circle, so you won’t miss a single amazing project. If you get stuck, you can always click the link to the Stamp Review Crew to take you to the master list. I wanted to get this stamp set as soon as I saw it for a couple of reasons. First, well, they are MASON jars. Second, I knew that it would be perfect to make a jar of honey for Rosh Hashanah, which is what I have for you today. I printed the sentiment in Hebrew. It says “Shana Tova U’Metuka” which translates to a good and sweet year. I made the background dots with the small circle included in the stamp set. (Truthfully, I didn’t even know it was there and it was perfect!) They are supposed to be reminiscent of apples. For my second card with this set, I used the fireflies. I love fireflies and we don’t have them here in Southern California. To make the fireflies, I first sponged on Whisper White Craft Ink. When that dried I stamped the firefly on top in black. Then I colored the tail with the Crushed Curry Marker and finished it off with Clear Wink of Stella on top. Thank you for hopping with us today! 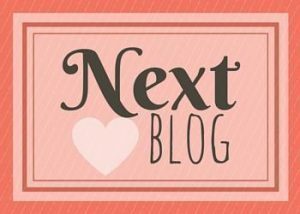 Your next stop is over at Tanya Boser’s Blog. I can’t wait to see what projects she made! 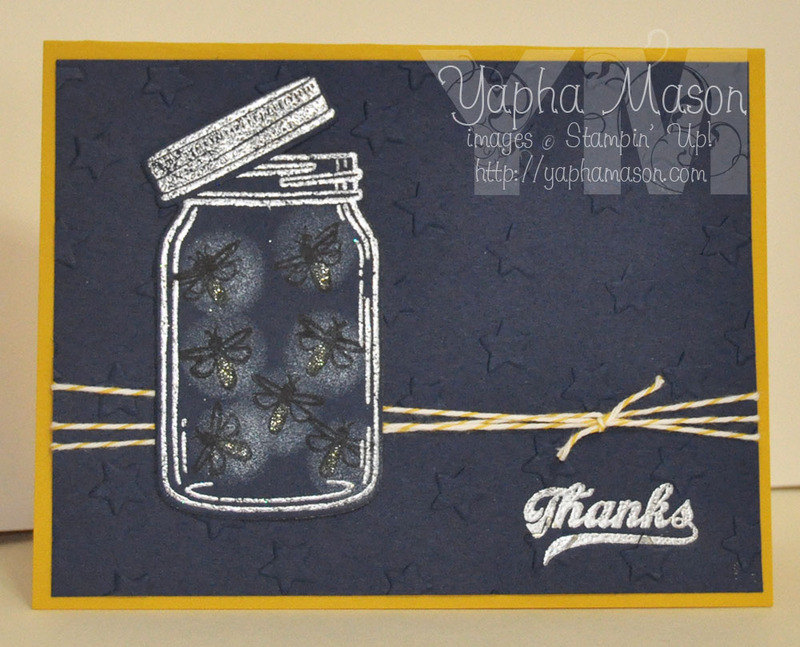 I love the Rosh Hashanah card — that jar of honey looks so real! So great! I’m going to CASE the jar of honey for my cousins’ new years card. It’s in September, right? Wonderful idea to make a jar of honey! And your firefly card is such fun! 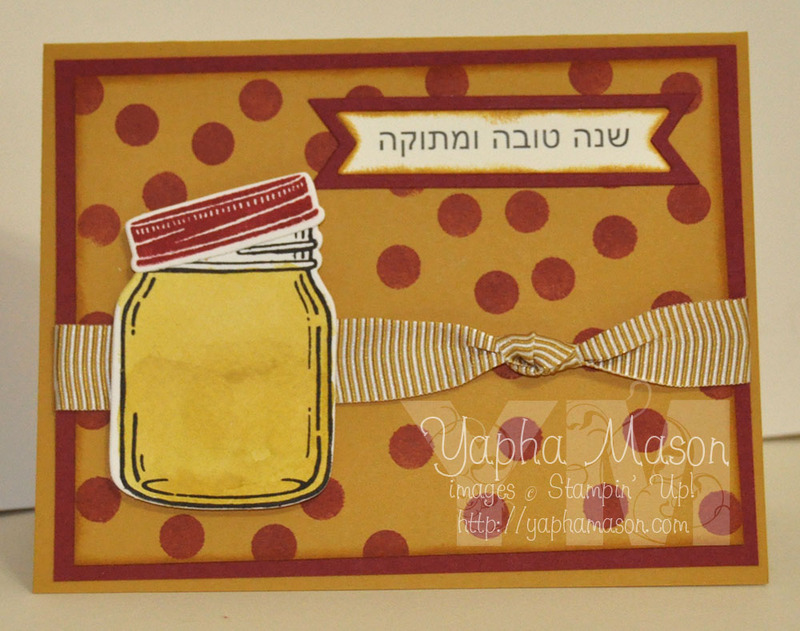 Wonderful idea for the Rosh Hashanah card! And I like your white craft ink technique for the firefly jar too! Great cards! 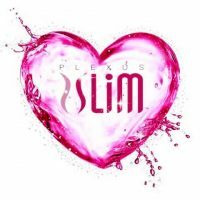 I love your takes on the jar image and what to fill them with!! Wow! Yapha, what a creative and super way to use the stamps. Every year you seem to find a way to make your apple and honey card for Rosh Hashanah. I just love your creativity! BTW, those fireflies are too darn cute!